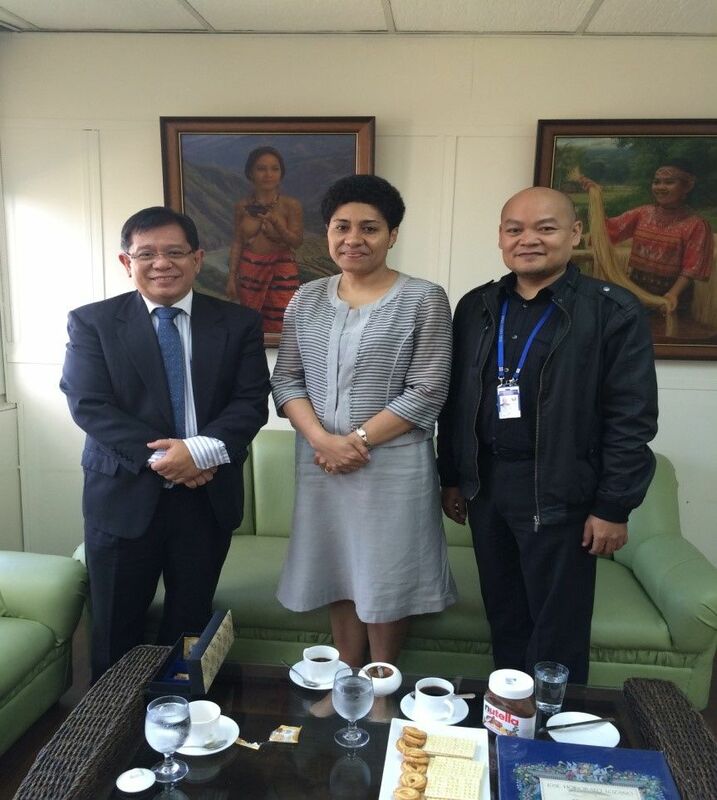 On Tuesday, 24th February, Counsellor Korovou met with Ambassador Jose Maria Carino of the Technical Cooperation Council of Philippine, Department of Foreign Affairs (DFA) along with his Planning/Programme Officer-Mr. Manuel Almira. 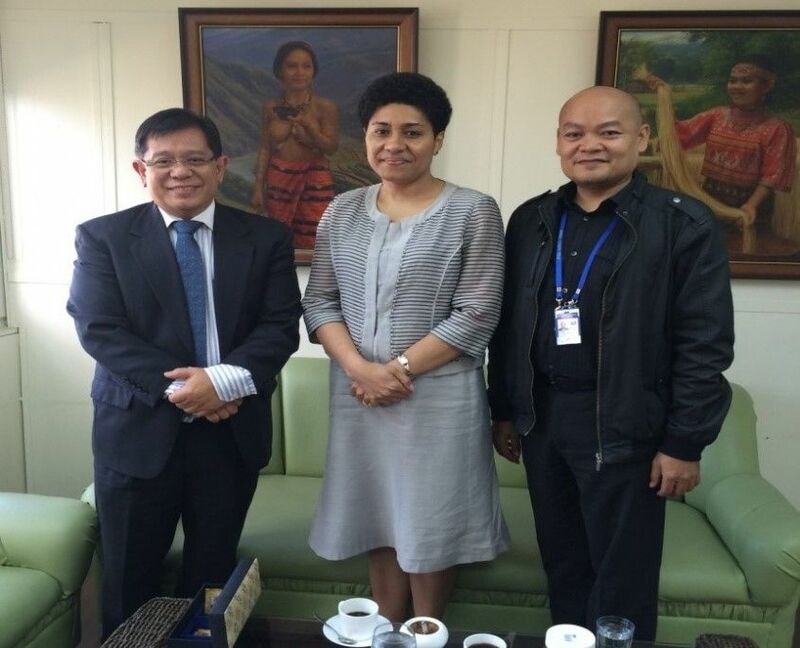 The meeting with Ambassador Carino was initiated during Counsellor Korovou’s audience with Mr. Jason Anasarias the Assistant Director for Asian and Pacific Affairs of the DFA Philippine on 23rd February. At the outset Counsellor Korovou expressed her sincere appreciation to Ambassador Carino for endorsing the meeting request at a very short-notice. The meeting succinctly manoeuvred to underline focal areas of cooperation that are of priority to Fiji as well as would be practical for the TCCP to implement within the 2015 fiscal year. Counsellor Korovou advised that inter-alia agri-business, agri-tourism, entrepreneurship capacity development, downstream processing of local resources, aquaculture, TQM and investment/product packaging are certain spheres high on the list for technical cooperation. In that regard, Ambassador Carina, advised on the following cooperation that the TCCP could arrange and implement as early as in April or May; 1) Organic farming and agri-tourism; and 2) Gender development and entrepreneurship for women. Other prospective areas mentioned for technical cooperation include fruit preservations and fish preservation. Ambassador Carino remarked that the South-South Cooperation have largely underpinned the level of cooperation either bilaterally or multilaterally between Philippines and PICs as well with Asian countries. Countries that have benefitted from the same joint venture or cooperation were Myanmar, East Timor, Nauru and Tuvalu. 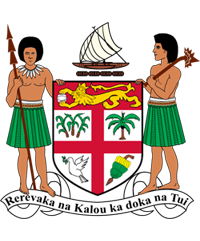 In closure, Counsellor Korovou sincerely thanked Ambassador Carino for the proposed joint venture and advised that she would need to confer with the relevant authority/Ministry in Fiji and revert with advices. Ambassador Carino expressed high hopes for the cooperation to materialise.